Was quite upset on Sunday when there was shooting down on the levels and no birds, but happier to report 5 Curlews were south of Rye Farm Friday morning (30/11). I’m sure I’ve only personally seen one in the area previously (in 26 years) and it was on the Steyning side of the river! Distant pic attached, visible on the “island” to the right of the gull. Lovely to hear them “curlewing” as they flew. 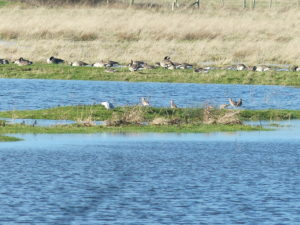 Also 20 Lapwing, 40 or so Common Gulls and a few Black-headed. About 10 Teal, lots of corvids, some of which were chased off a Sparrowhawk. A lot of noisy Geese, both Greylag and Canada. And a couple of decoy ducks from Sunday were still bobbing around! This afternoon 2 Barn Owls hunting over the fields west of Chates, a Stonechat was flitting about near the bank and Snipe called from the field too.